I had another post planned for today but since the news isn't finalized yet I can't share it quite yet. By Monday for sure though. So instead I'm sharing a new recipe with you! Monday I had my monthly Pampered Chef meeting at it was Recipe Round up night. Everyone brought one of the new recipes for the new season. I liked this one so much I actually made it last night! Be proud! 1. Mix mayonnaise and rub in (1-cup/250-mL) Prep Bowl; set aside. Slice sausages in half lengthwise then crosswise into 1/4-inch-thick (6-mm) slices using Color Coated Chef's Knife. 2. Cut bell pepper lengthwise into 1/4-in. (6-mm) strips then crosswise into 1-in. (2.5-cm) pieces. Combine sausages and peppers in Large Micro-Cooker(R); set aside. 3. Prepare pizza crust mix according to package directions; knead on floured Pastry Mat 1 minute or until dough is no longer sticky. 4. Roll dough to a 12-in. (30-cm) circle using Baker's Roller(R). Brush bottom of (12-in./30-cm) Skillet with 2 tsp (10 mL) of the oil using Chef's Silicone Basting Brush. 5. Place dough into Skillet, gently stretching and pressing dough to cover evenly. Brush dough with remaining 2 tsp (10 mL) oil. 6. Cook dough, undisturbed, over medium-high heat 4-7 minutes or until crust is golden brown. 7. 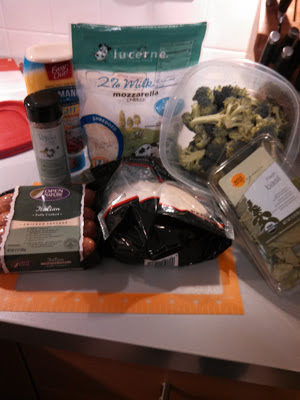 Microwave sausage mixture, uncovered, on HIGH 1-2 minutes or until hot. 8. 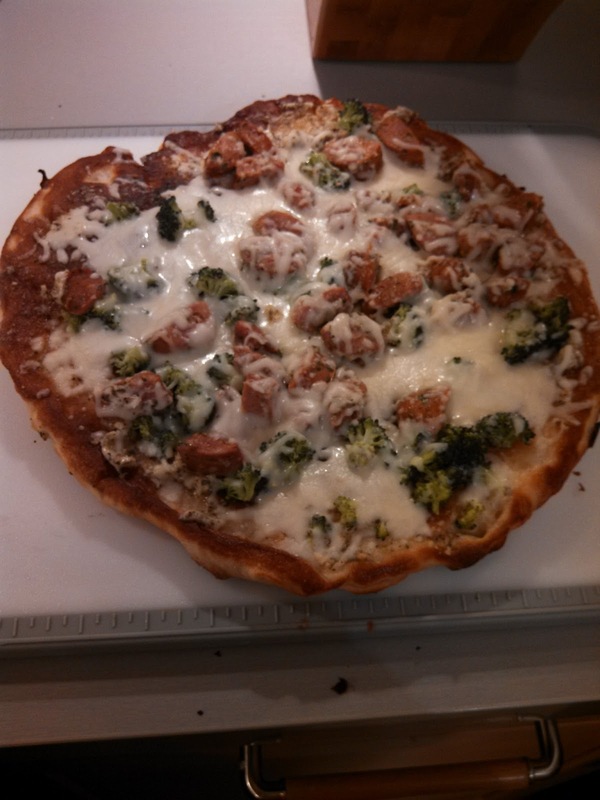 Flip crust over using Nylon Turner; top evenly with mayonnaise and sausage mixtures and cheese. Cover; cook 5-7 minutes or until cheese is melted and bottom of crust is golden brown. 9. Remove pizza from Skillet; cut into 8 slices. Garnish with basil. Cook's Tip: To make this recipe with refrigerated bulk pizza dough, let 10 oz (300 g) dough stand at room temperature for 15 minutes. Omit Step 3 and continue with recipe as directed. 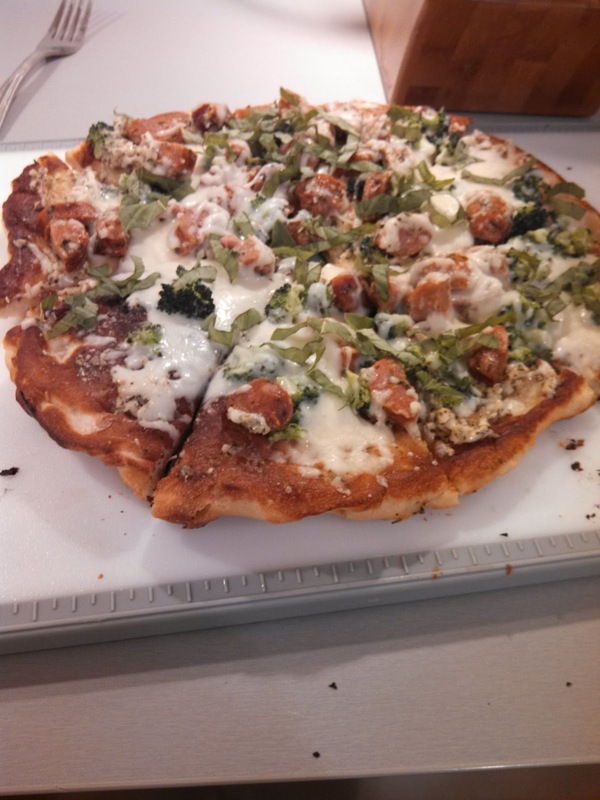 To make pizza in the (11-in./28-cm) Skillet, prepare dough as recipe directs, rolling to a 9-in. (23-cm) circle. Continue as recipe directs. It actually cooked quite quickly so Kevin and I didn't have time to take any more photos. I used Italian Seasoning Mix instead of the Fennel and Herd Rub since that's what I had on hand. Be sure to watch the temperature of your stove top. We didn't when we flipped it over and burned the bottom a bit but Kevin actually kinda likes pizza that way so as he says Nom Nom Nom!